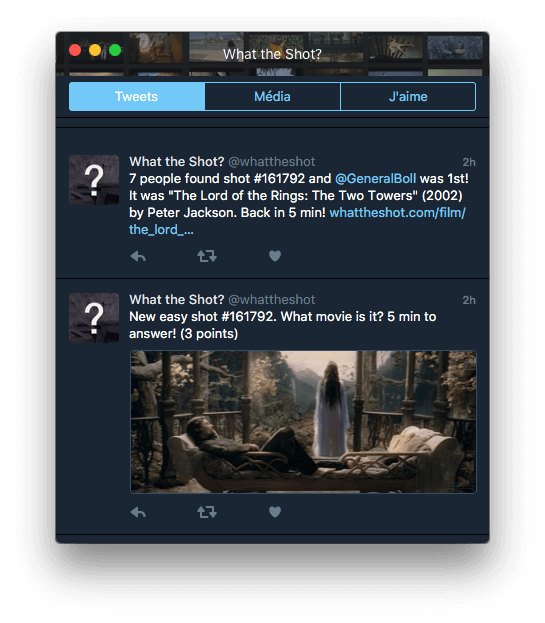 WTS is a unique quiz game for all movie lovers running since 2010 on Twitter. It was developed in part of the Whatthemovie's project. Follow @whattheshot to play. Every ten minutes, a snapshot (up to four) from a movie is sent with a question. You have five minutes to guess the answer by simply replying to the bot (the movie's title, the person's name etc). Depending of the difficulty of the shot — easy, medium, hard —, the first to guess the answer will get up to ten points, and the others will get some points. You get double of points by answering the full answer (the full title in its original language for movies, or the full name for people). You can send commands to the bot. For example, send rank to get your position in the tops, record to get your personal records and time to see how fast you answered correctly the shot. It's not simply a quiz, it's also another way to discover new exciting movies through pictures. From The Dark Knight Rises to La Dolce Vita, movies are from all genres, decades and countries, to please everybody. Earn points by answering correctly and compete with other players to reach the Daily, Monthly, Yearly & All Time Hall of Fame! Can you answer in less than 10 sec? Make 50 points a day? Break your own Records or even the World's Records & get extra points! A hint about the answer — director, main actor etc— is posted if nobody found the shot yet after three minutes. The bot interacts with you in real time in many languages (English, Spanish, French) even using sometimes movie quotes. Care about Stats? Every Player has its own User Profile on the website with tons of different statistics about the way it plays! Depending of the news and the day, we organize special themes for a given period of time. Only shots that match the theme are featured. Daily featured players who correctly guessed at least a shot. Check their User Profile's Page to learn more about them, see their rank and statistics. Movies that were recently featured in the game. Check their page to see more informations about them.